It seems that there are 5 magical universities in North America and our heroine attended Penrose Academy. The 5 included Voudoun University which was a party school hidden in New Orleans and Our Lady of the Labyrinth in New Mexico which had no grades, no semesters and only ‘friends’ rather than students with a great golf course. The most interesting of course was the Northern Californian Arcane Polytechnic Institute, which occupied the same physical space as Stanford but was 10 seconds into the future, which meant that students could get degrees from 2 universities! Penrose had a bar that sold Shamrock shakes – green with good luck charm included and a magical library which had book wars – where the books which suggested one theory would go to war with books that suggested an alternative theory; where the books moved about; where the books would give themselves up to a librarian if they were shelved incorrectly; and where the librarians were magically chained to the library and needed to be paid before you could enter the library. Another clear reference to other stories but done well enough not to irritate. As the book also has the traditional werewolf struggling with his ‘curse’ and a witch and lots of references to current music I am sure it will appeal very much to the YA audience. The Harry Potter allusions help but don’t overpower and the writing style is fun and easy to read. 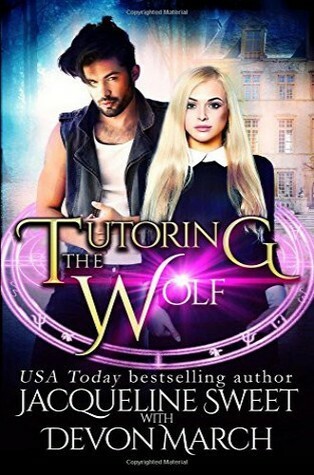 Sign into Goodreads to see if any of your friends have read Tutoring the Wolf.